The autumn leaves, vibrant and warm not long ago, seem to be turning dull and brown faster than the temperatures are dropping. There is a place, however, that is brighter than ever at this time of year. Adorned with rich autumnal hues, brimming with the season's best squash, tubers and root vegetables, you can count on your local farmer's market stands to bring some vibrancy back into your day. Behind the stands, stacks of mason jars line the walls, adjacent to pies overflowing with seasonal fruits. An intoxicating smell of mulling spice is in the air... Suddenly, when you're here, the word autumn becomes synonymous with comfort. Trading flowy dresses for chunky cable knits, replacing bonfires with fireplaces, comfort is the word of the season - especially when it comes to our meals. Is it possible for a salad to be a comfort food? Toss these three things with a head of lettuce and voila! Autumn gourmet - comfort salad. So sit back, pull up your legwarmers, and breathe in that oddly comforting, subtle smell of burning insects of seasons' past as you turn on your electric heater for the first time. And then, enjoy this salad. Let it warm your body and your soul. Or at least just your body. Or, eat it cold if you prefer. You know, you should just eat this no matter what. Preheat oven to 300F. Toss pecans with beaten eggwhite in a medium bowl. In seperate bowl, mix all of the spices together. Toss coated pecans with spice mixture. Spread evenly on parchment-lined baking sheet. Bake for 23 minutes. Remove from oven and let cool completely. While pecans are roasting, prepare your pears. Beware: your house is going to smell amazing. Slice pears into about 6 sections each. Remove seeds and stem. In a microwave safe bowl (or on the stovetop) melt butter and brown sugar together. Whisk in salt. Toss pears with butter/sugar mixture. Lay evenly on parchment lined sheet. Once pecans are done, turn oven up to 325F. Roast pears for 15 to 18 minutes, or until they begin to soften and brown. While pears are roasting, prepare dressing by combining all ingredients and whisking until smooth. 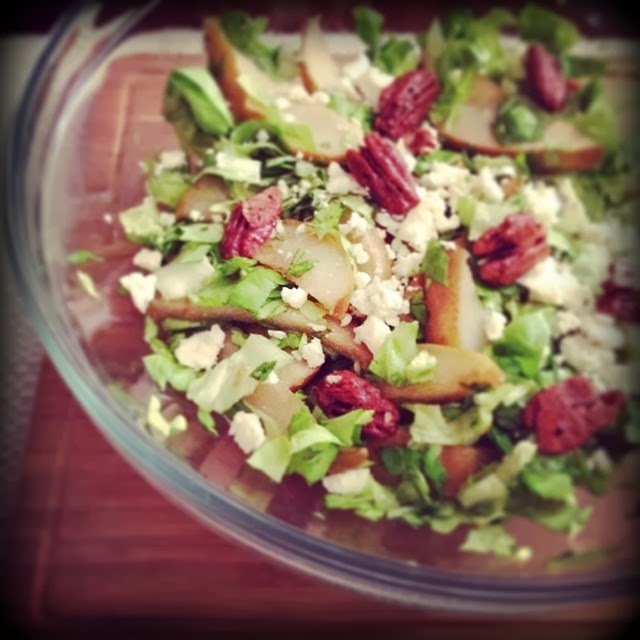 Toss finished pears with chopped lettuce and pecans. Top with cheese and drizzle with dressing.